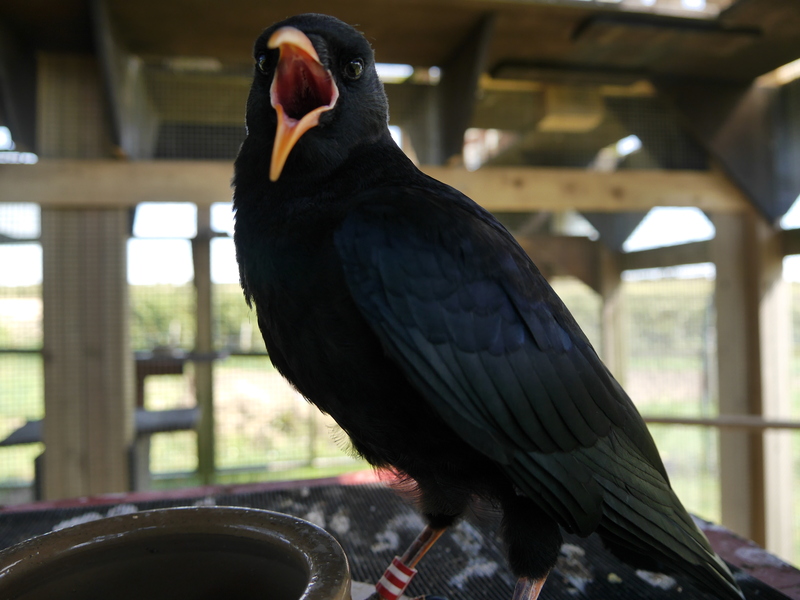 Grace, a 2014 parent-reared chough, disappeared on the 18th August 2015. Photo by Liz Corry. 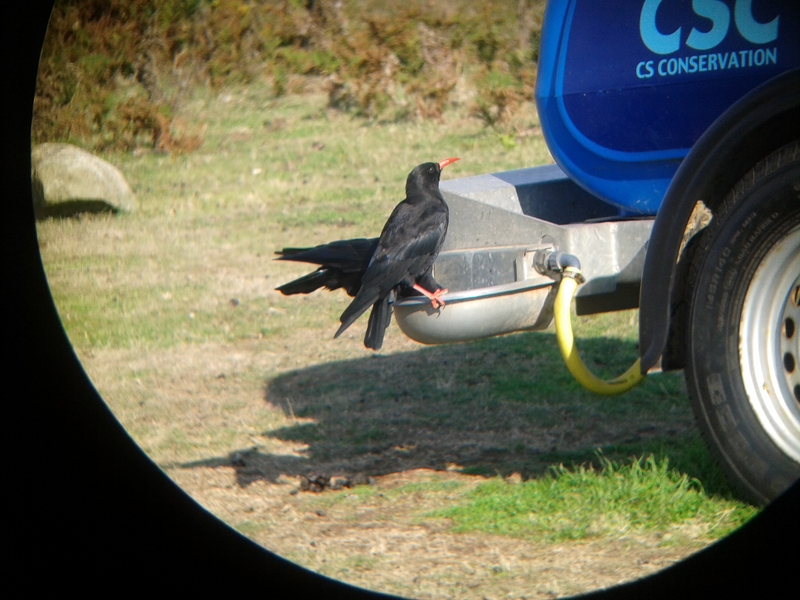 On 18th August one of the 2014 parent-reared choughs did not show up for the supplementary feeds. 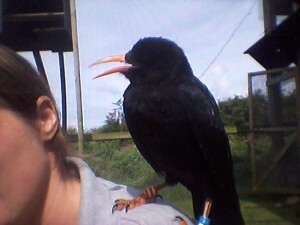 Grace, so-called because of how choughs manoeuvre in the air, had been around the day before feeding with the others. The group have been exploring different areas of Sorel recently and we hoped she had just split off and become preoccupied. It soon became clear that Grace was no longer with the group. We have not seen or heard from her since the evening of the 17th. The weather had not been particularly bad at that stage and she had not appeared unwell or underweight. We have not had any reports of choughs being seen elsewhere on the Island in the last two weeks. Our assumption is that she has unfortunately died for reasons we will most likely never know. Drinking from the water dispensers for the sheep at Sorel. Photo by Liz Corry taken using a digiscope. 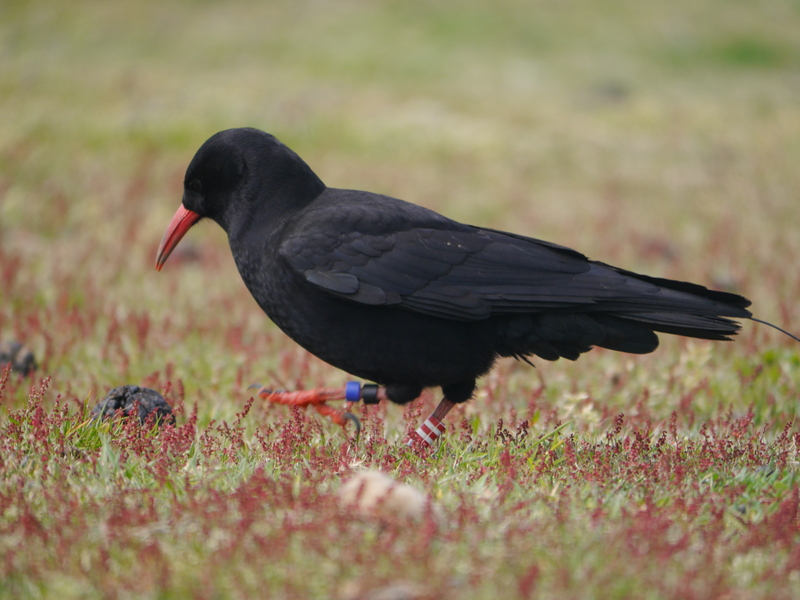 This means that of the twenty birds we have released since 2013 we still have fourteen choughs living at liberty around Sorel. The wild born chick brings the flock size to fifteen. This exemplifies why we need to release several groups of choughs over the years rather than do a one-off release and hope for the best. The short video clip below gives you an insight of what the choughs were getting up to at the start of August before Grace disappeared. Dusty the wild born chick, learnt to be more independent by the end of the month and, therefore, less whingey. 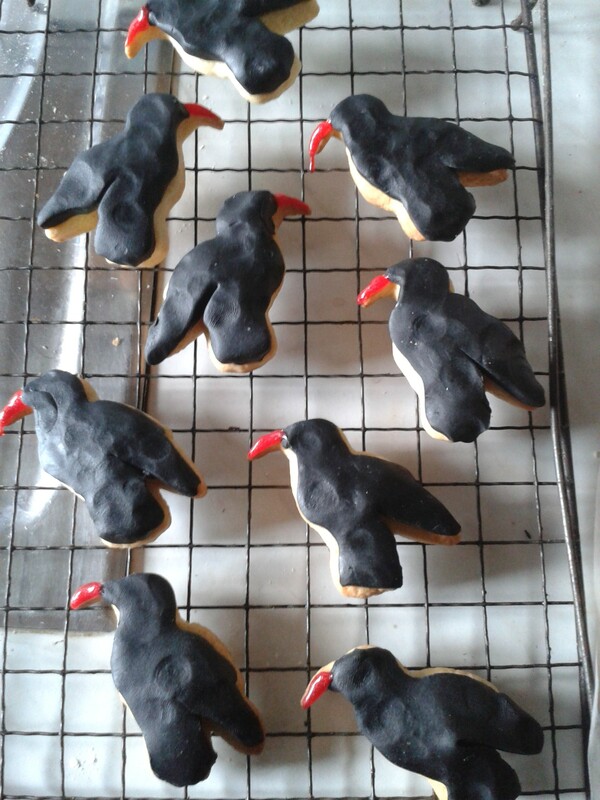 The free-living choughs arrive to greet the parent-reared chicks who have now completed their quarantine period. Photo by Liz Corry. 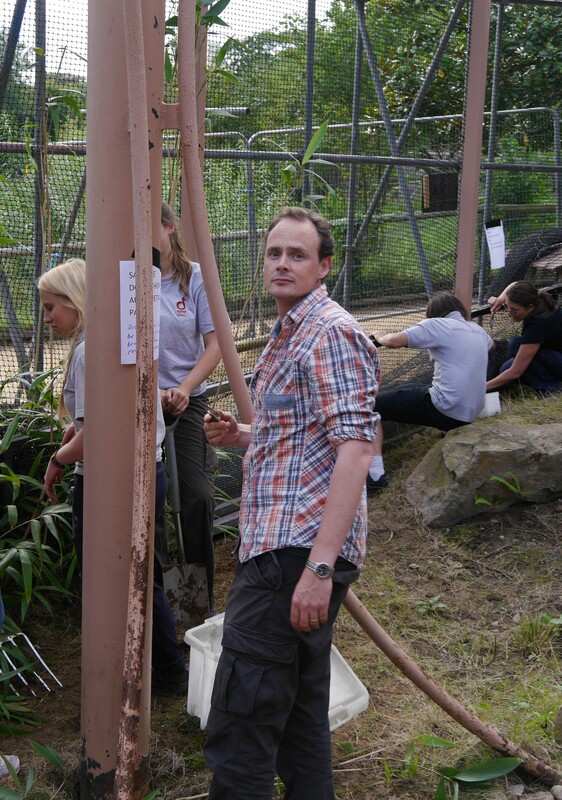 The eight chicks which arrived from Paradise Park in July completed their quarantine period on the 17th of this month. They were given access to the entire aviary which meant the free-living birds were locked out. They need this space in order to build up their flight muscles and practice flying through hatches on command. They also get to see more of the surrounding environment and orientate themselves to some extent in preparation for the first day of release. 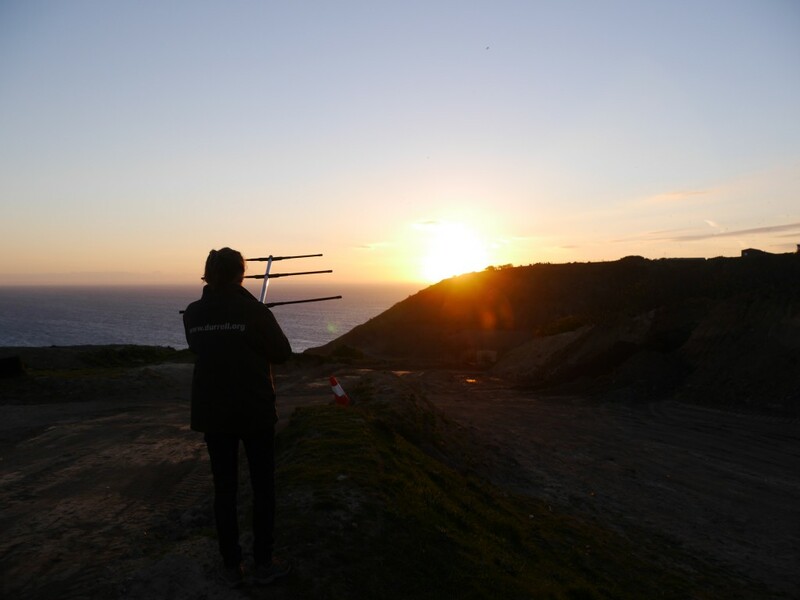 The radio-transmitters arrived from Biotrack Ltd on the 24th. High winds and non-stop rain at Sorel delayed fitting the transmitters until the 28th. This in turn postponed the release which we had hoped to start as close to quarantine ending as possible. 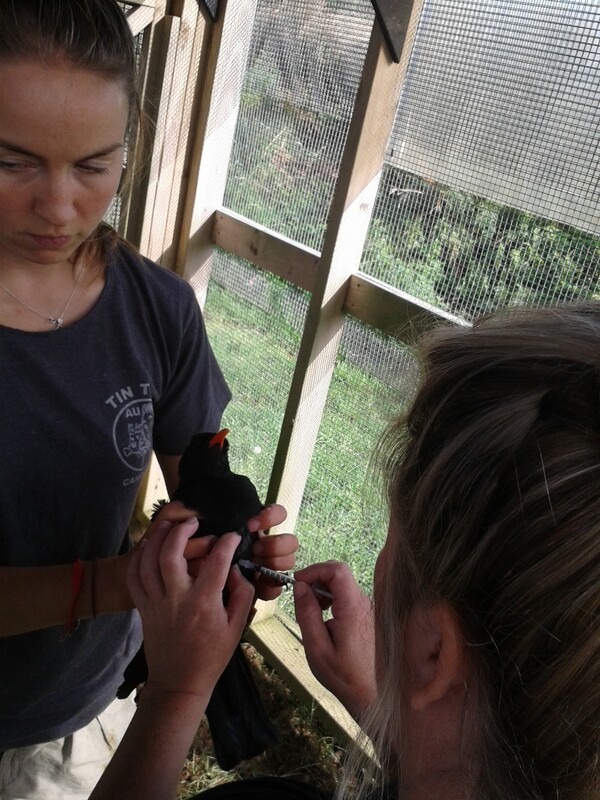 Vet nurse, Mel Frost, injects one of the sick choughs with a wormer. Photo by Liz Corry. During the same week, to further delay their release, certain individuals within the group started sneezing. Soon two of the males were open-mouthed breathing at rest. Not a good sign. We decided to blanket treat the group (that is, every bird in the group whether sneezing or not) and inject Ivermectin whilst we had each bird in the hand to fit transmitters. They will need catching for a second dose in a couple of weeks. We aim to give the parent-reared chicks access into the wild once they are healthier. Our hand-reared chick heads home. It was inevitable that our hand-reared chick, CeCe, would return to the Wildlife Park and did so last week after two months living in the release aviary at Sorel. The other chicks had accepted her as part of the group. Since fledging in the aviary she had become a skilled flyer and very adept at probing for insects (then burying them out of sight of the others); however, her level of tameness around people always raised concerns. There had been a change in her behaviour from mid-August whereby she was more apprehensive around staff. When the group reacted to anything she would follow. We started to think she might be ok when released. If a peregrine was to attack the group when they eventually fly free she would take cues from the group and avoid attack. As with any other social bird she would stick with the group when they looked for shelter from the elements and find a safe roost site if they choose not to use the aviary. CeCe, the hand-reared chick demonstrating why she will not be released into the wild. Photo by Liz Corry. However, our main concern was whether she would fly to members of the public and beg for food as she does with staff who hand-reared her. Whilst I am sure the majority of the public would love this experience there was potential for her to come to harm through her naivety. We enrolled a couple of willing volunteers and put it to the test inside the aviary. CeCe was horribly conflicted. She begged but kept her distance. Although the look of conflict on her face suggested that she would soon change her mind if there was no clear threat. Her destiny had been determined. She would return to the Wildlife Park to be an ambassador for the restoration project. Once she has completed her quarantine requirements she will join the Durrell flock in the display aviary. 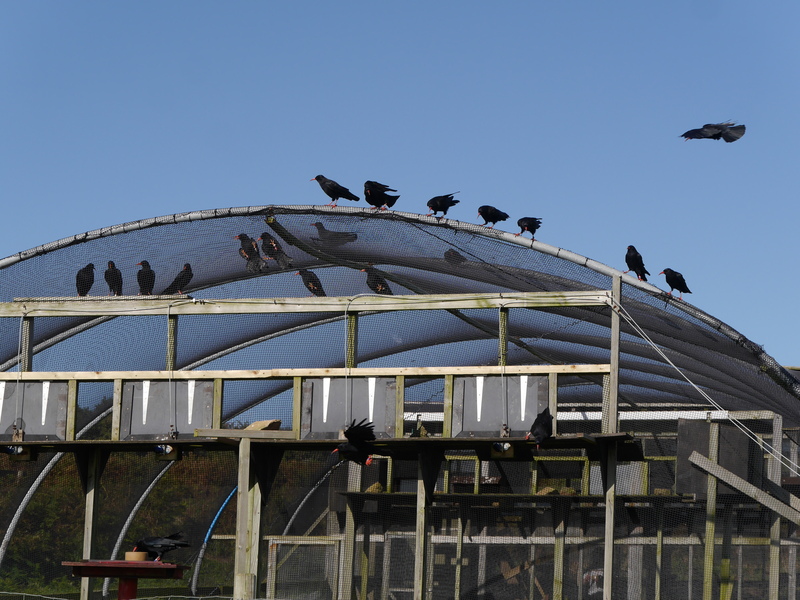 The display aviary at the Wildlife Park now has new netting and brand new uprights to create a better flying area for the choughs. 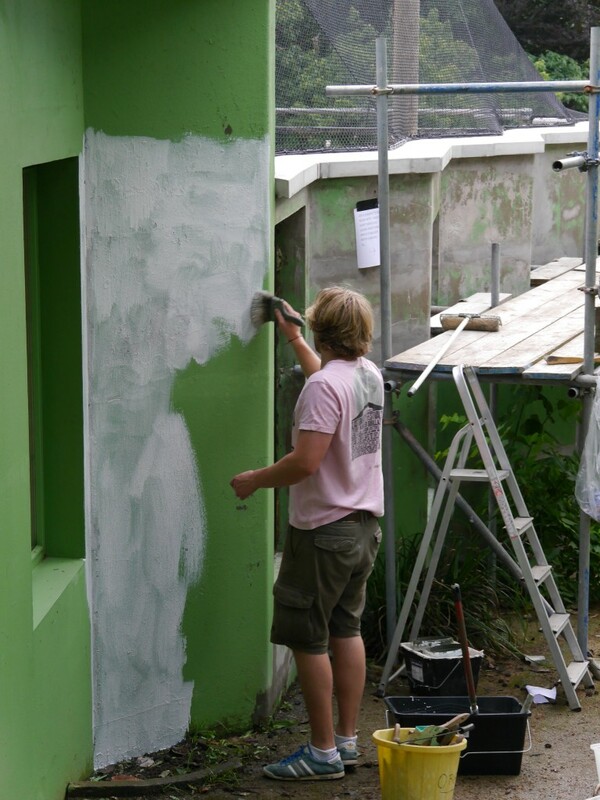 The building work has meant that the walls desperately needed rendering, a new coat of paint and the inside needed re-landscaping. 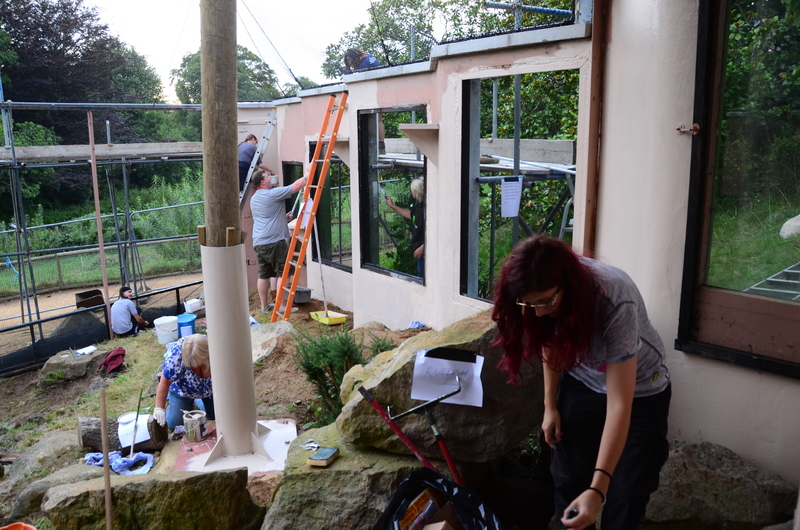 A lot of jobs which could drag out the completion date and force the birds to stay isolated in their breeding aviaries even longer. 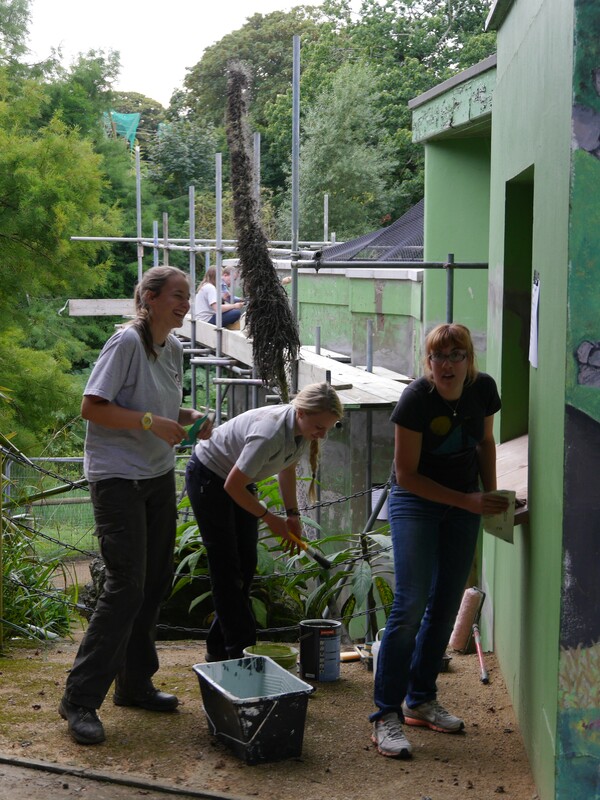 Durrell’s army of staff and volunteers took up the call to arms on Friday 28th August. Scrapers, paint brushes, and rollers aloft they went into battle. Or at least that’s what any passer-by would have thought considering the amount of paint that ended up on people as opposed to wall! That being said the team managed to achieve a great deal in two hours. 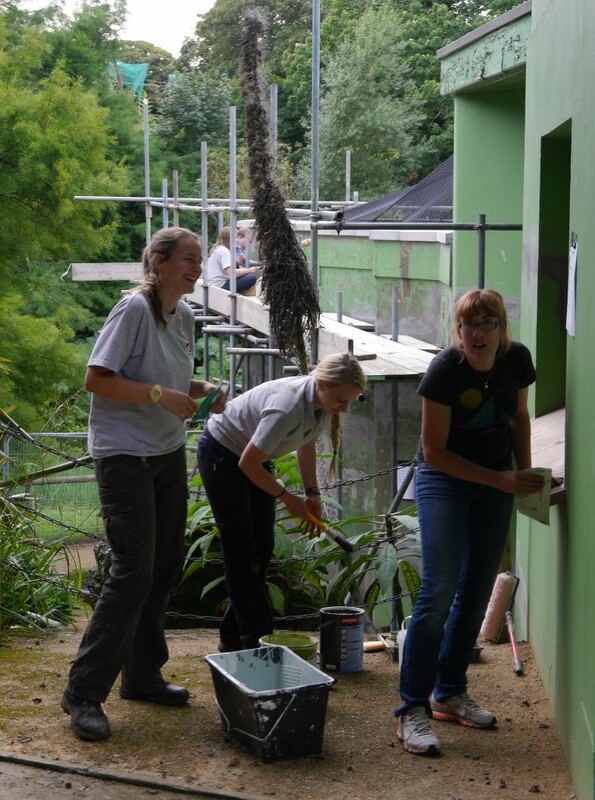 Staff and volunteers and Durrell help with the display aviary renovations. Photo by Jonathan Stark. In this case sitting down on the job is permitted. Photo y Liz Corry. Andrew Terry, Head of Field Programmes, got involved. We had a limited number of ladders so his height played an advantage. Photo by Liz Corry. Team work. 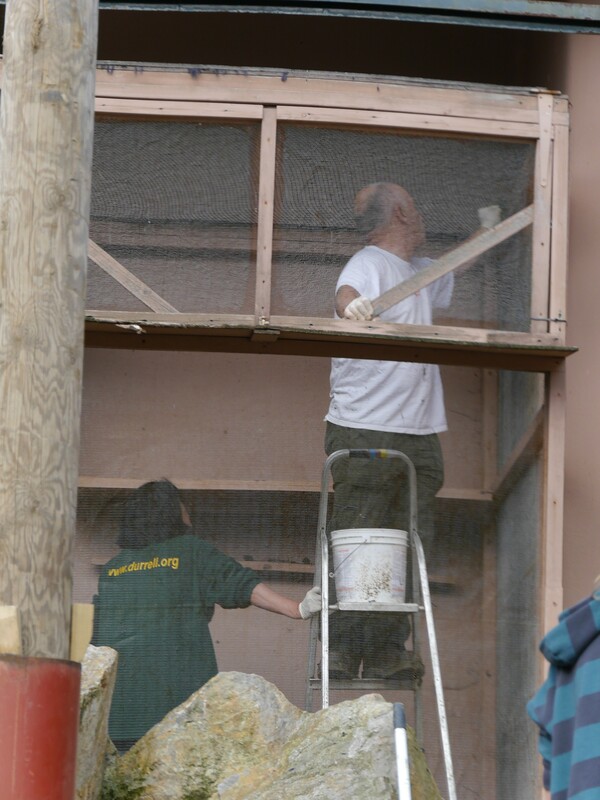 Durrell’s Head Vet Andrew Routh and his wife Sorn, renovating the catch up cage. Several requests by Sorn to lock him in were denied. Photo by Liz Corry. Senior bird keeper, Hester Whitehead, eventually realised that the other keepers’ refusal to paint without left-handed paint rollers was not legit. Photo by Liz Corry. ‘Sea fog at Sorel’ by Alex Roberts. Otherwise known as applying sealant paint. Photo by Liz Corry. We started after work at 6pm and continued until the sun had set and the paint tins were empty. Café Firefly kindly provided nourishment in the form of Thai green curry (much to the bemusement of people arriving to collect their takeaway orders). 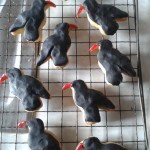 And the choughs provided baked goods! We could not finish everything. 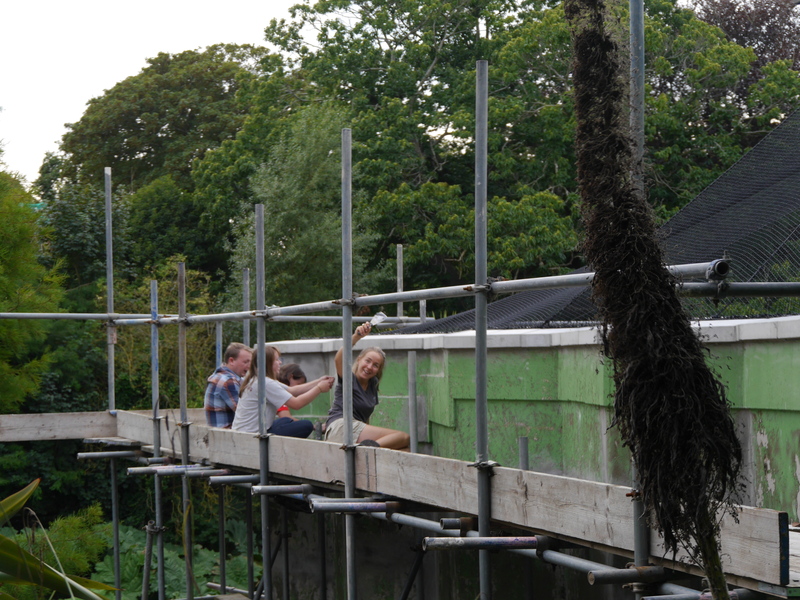 A second coat of paint is needed and for the sake of the ibis trying to sleep next door we could not carry on later into the evening. The jobs that could be ticked off the list have meant we can bring forward the completion date. 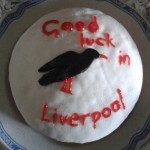 The choughs will be eternally grateful to all those who volunteered their time that evening. Harriet Clark, field assistant and trainee bird ringer, bade farewell to the choughs and Jersey at the end of August. Harriet has been with Durrell on and off for the last five years as student, then keeper, and for the last 16 months as our field assistant. She has been there for all of the 2014 releases, helped hand-rear Chickay, Bean, Caûvette, Dingle, and CeCe, and assisted Gianna in foster-rearing Special K who sadly never made it to Sorel. 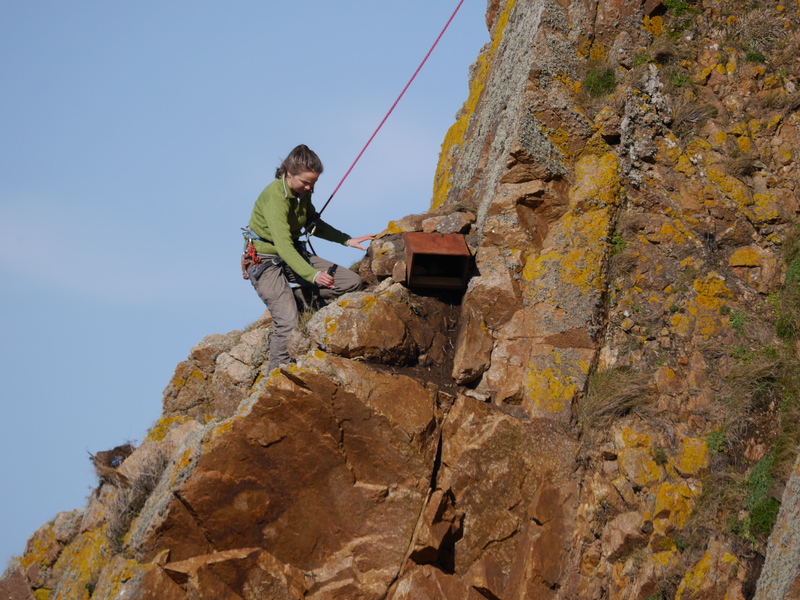 Harriet inspecting a chough nest box. Photo by Liz Corry. Harriet radio-tracking the group released in April 2014. Photo by Liz Corry. Part-time shepherd. All lamb cuddling carried out under license. Photo by Liz Corry. There have been highs and there have been some very low, lows. Harriet has persevered throughout and showed incredible professionalism and dedication. Then again she is also probably the only person I know who would go up a metal ladder in a thunderstorm to secure a hole in the aviary preventing the birds escaping. In theory of course. This never actually happened because she never told me! I’m sure all of you who have had the pleasure of working with Harriet will join me in thanking her for hard work over the years. 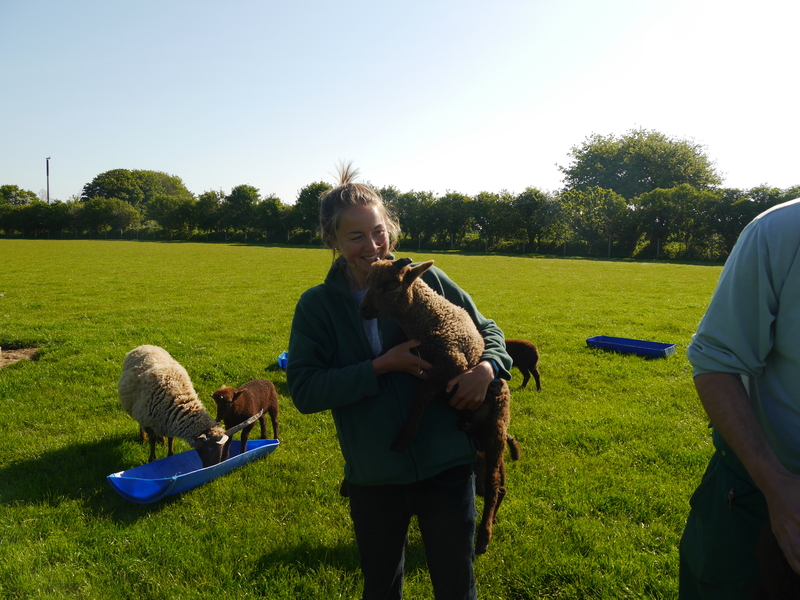 We wish Harriet all the best as she takes on a Masters in Conservation and Resource Management at the University of Liverpool.